Well, here it comes on February 24: the paperback edition of One Way Out: The Inside History of the Allman Brothers Band, updated with an extensive new chapter on the Allman Brothers Band‘ tumultuous final year, and 15 new photos by Kirk West, Danny Clinch Photography, Derek McCabe – and Derek Trucks! The latter are exclusive shots from final Beacon rehearsals. Plus NEW Interviews with almost everyone, and a check-in with Dickey Betts. We will be celebrating the release of this new edition of One Way Out withthe special events detailed below. Before all the following madness ensues, the Big in China band is playing this saturday, February 7 at the Boxcar Bar and Grill inside the Short Hills Train Station. This is a totally cool place. If you are anywhere nearby, come on by. If I get my shipment in you might even be able to buy a very preview issue of the One Way Out paperback. We are excited to play this cool and funky spot for the first time. Who doesn’t love a train depot? Worried about having Beacon withdrawal syndrome this March? We’ve got you covered – kicking off March with a tremendous evening. 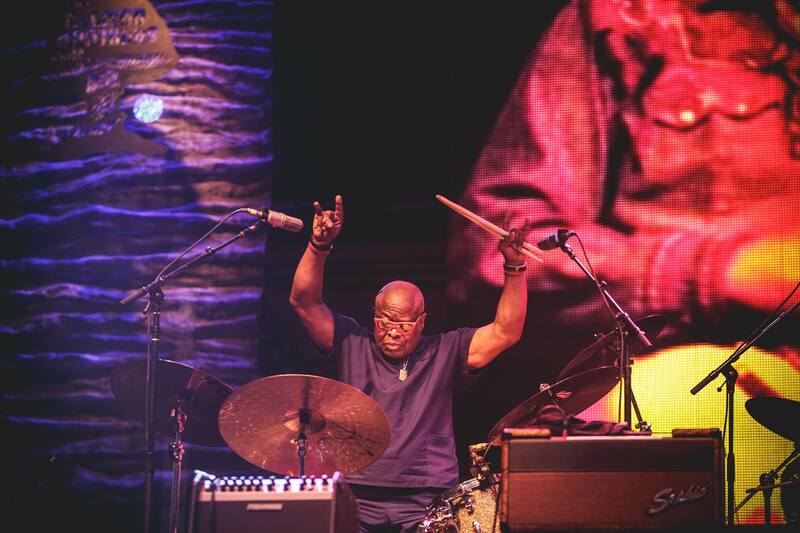 The great Jaimoe’s Jasssz Band led by ABB drummer and founding member Jaimoe and featuring Junior Mack and Bruce Katz headlines with their hard-swinging blues and jazz. Opening up is Scott Sharrard and the Brickyard Band. Scott is Gregg Allman’s guitarist and Musical Director. Expect Special Guests and good times. Jaimoe and I will be signing books. 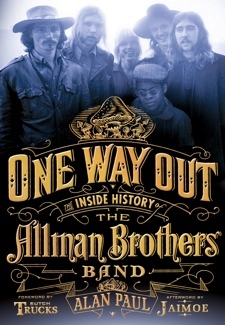 In addition to being Allman Brothers Employee Number One, Jaimoe, of course, wrote the One Way Out Afterword. Tickets $15 and available now. Talk and signing with Butch Trucks. Very excited to bring another ABB founding member and One Way Out contributor – Butch wrote the book’s Foreword – to my hometown of Maplewood for this. Butch is always outspoken, free-flowing and honest. This is one you won’t want to miss. Doors 7 PM, showtime 8 PM. More info here. 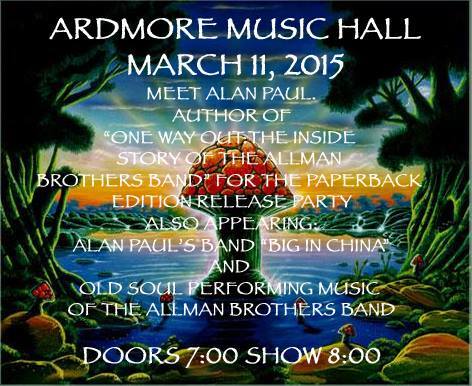 My Big in China bandwill be performing, followed by the great Philly group Old Soul, presenting a night of Allman Brothers Band music and more. I will, of course, be selling and signing books. 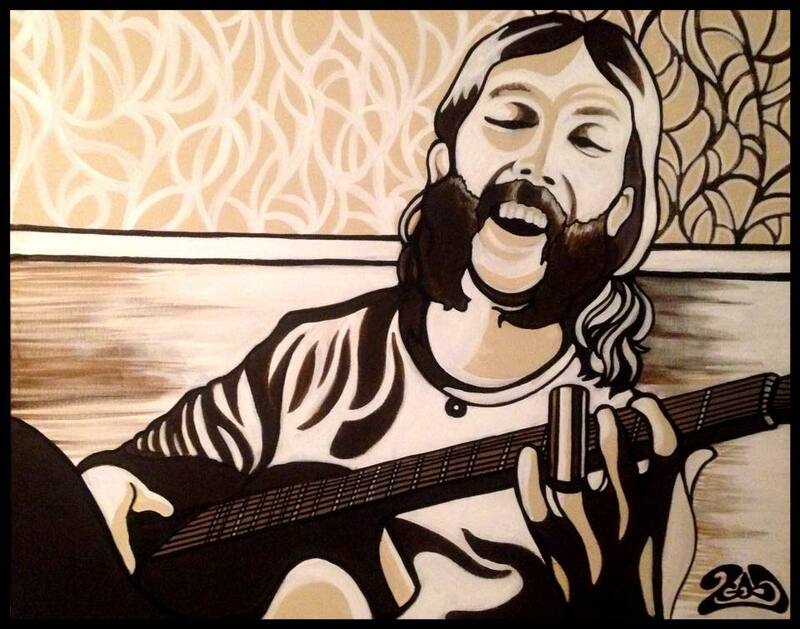 And Philly artist Francis 2Good will be on hand to do a live painting of the Original Allman Brothers Band, and will also have prints and T-Shirts available of his Duane Allman painting done at the end of 2014 to commemorate the 45th year and retirement of the band! •Friday, March 20, Big in China band at the Gladstone Tavern. Another new venue for us – this is a fantastic restaurant and bar in a beautiful, bucolic setting just about 20 minutes west of Maplewood. Please join us. 9 Pm – 12 am. For this gala night at TSTI, BIC will also feature keyboardist Mark Alexander (The Rascals, Joe Cocker, Little Steven) and guitarist Andy Aledort (Dickey Betts’ Great Southern, Band of Gypsys, Tribute to Hendrix). Information to come soon on tickets, which will include food and drink. We played this party last year, also with Andy and Mark, and everyone had a great time. 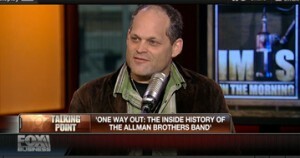 A conversation with ABB biographer Alan Paul, author of the best selling One Way Out: Inside the History of the Allman Brothers Band. Alan Paul, a senior writer for Guitar World magazine, has covered the Allman Brothers for 25 years, conducting hundreds of interviews and attaining an unprecedented level of access and information. 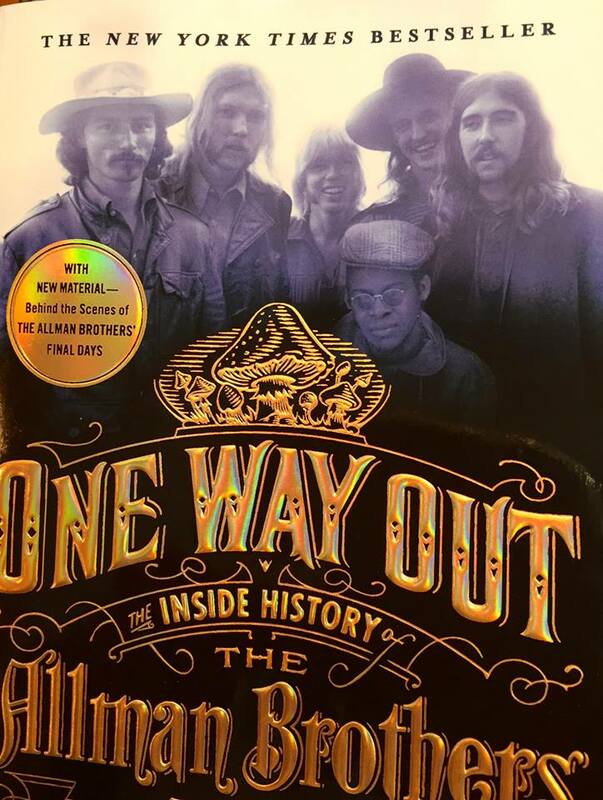 His best-selling oral history One Way Out: Inside the History of the Allman Brothers Band is the definitive book on the band. Paul will be in conversation with Kirk West, the band’s legendary Tour Mystic and photographer, who was the photo editor of One Way Out, which includes 150 images, most of them never-before-seen. Paul and West will offer up deep insights into the Allman Brothers Band and what has made them one of American rock’s greatest, most enduring institutions. SOUTHEASTERN TOUR WAS TREMENDOUS. THANK YOU TO ALL CAME OUT. The Atlanta area’s premier indy bookstore. Very excited to be back where it all begins for the ABB – and in conversation with the wonderful Jaimoe. Expect appearances by several other members of the extended band family. Looking forward to appearing a this fine store in Warren Haynes’ hometown. I will be joined by OWO Photo Editor and Legendary ABB Tour Magician Kirk West, who will be showing photos from the book. This is going to be a very special night at Nashville’s Allman Brothers home base. I will again be joined by OWO Photo Editor and Legendary ABB Tour Magician Kirk West, who will be showing photos from the book. After our talk and signing, the Midnight Riders, a fantastic ABB tribute band featuring some great Nashville pickers, joined by some special guests. Both Atlanta-based legends and fresh, inspired faces will share the stage to perform tunes by The Allman Brothers Band and other Atlanta artists. AM 1690 The Voice of the Arts presents this one-night-only, all-star concert celebrating the release of One Way Out: The Inside History of the Allman Brothers Band. The book chronicles the rise of the legendary Georgia group. 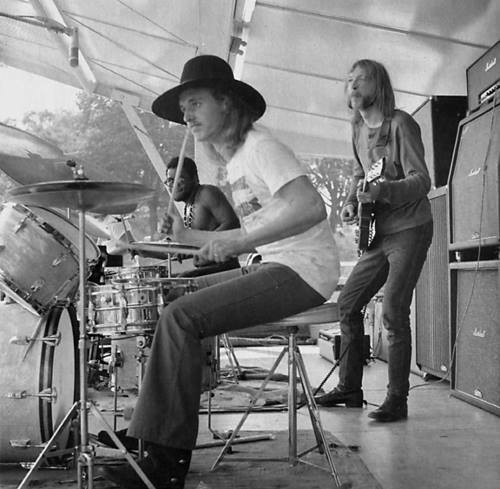 Part of the Allman’s story involved its fabled late-1960s performances at Piedmont Park. More than 40 years later, AM 1690 and Eddie’s Attic reunite many of the musicians who rocked that scene, along with other Atlanta musical luminaries who followed. Expect oodles of special guests, including key members of The Hampton Grease Band, as well as Atlanta luminaries Bill Sheffield, Barry Richman, The Swimming Pool Qs, Lamar Williams Jr., son of te late Allman Brothers Band bassist, and many others. Lots of surprises in store for you. Alan Paul will be on hand to sign copies of the book. A night to remember that’s not to be missed.. In conversation with Jaimoe – this will be fun and interesting. 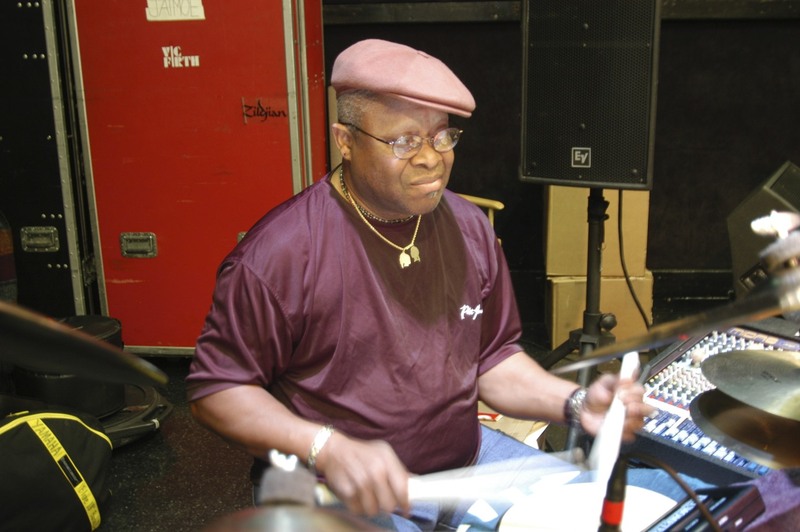 Jaimoe just may be the coolest man in the world. Come see why. He will be answering audience questions. 82nd and Broadway – Just up the street from the Beacon, of course. Every year, the great folks at Hittin the Note Magazine throw great parties to celebrate the Allman Brothers Band Beacon Theatre runs. I’m very pleased to be featured this year.I will be giving a book talk and signing – books will be available there from Hittin the Note, followed by a special performance of the Big in China band joined by guitarist Andy Aledort of Dickey Betts‘ Great Southern band and keyboardist Mark Alexander (Joe Cocker, The Rascals, Meat Loaf). It’s a noon start, but there will be a short acoustic set by another band first, One Eyed Jack. My portion of the day should start just after 1 PM. This will be a lot of fun. Come meet legendary ABB Tour Mystic Kirk West and see his fantastic photos of the Allman Bros, Grateful Dead, Bob Marley, Bruce Springsteen and many others. Alan Paul & The Big in China Band, again featuring Andy Aledort and Mark Alexander. Click on the link above to buy tickets, which include excellent food and drinks. I will be appearing as a special guest of the Tuesday Night Open Jam band, in conjunction with Ship of Fools.I will talk about One Way Out: The Inside History of the Allman Brothers Band and read a passage or two. New Yorkers: Metro North train goes to Norwalk without changing trains and has 2 stops, East Norwalk and South Norwalk. South Norwalk is closer to the bar and cabs are readily available.